Can you feel the HEAT?? I just realised today that i should have made this announcement a month ago, but i didn’t. Oh, well! 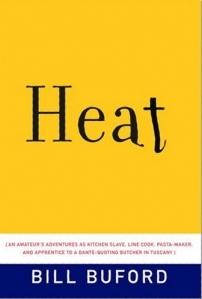 I am sure that most of you know that we are currently reading Bill Buford’s Heat: An Amateur’s Adventures as Kitchen Slave, Line Cook, Pasta Maker and Apprentice to a Dante-Quoting Butcher in Tuscany. Buford left his job as an acclaimed writer and editor at The New Yorker to apprentice in the kitchen of Mario Batali’s Babbo restaurant, and the book follows his adventures there as well as on his journey to Italy to discover the secrets to pasta-making and pig slaughtering. The deadline is December 3rd, so you have plenty of time to read and cook this truly exceptional book.